Why Obama needs to make it clearer to Democrats that he’s on their side. In the wake of defeats in New Jersey and Virginia, Democrats and the Obama administration are being advised to move to the center. I think the Republicans are well advised to take that advice, but I am not sure about the Democrats, and I am not sure what the "center" means in this case. 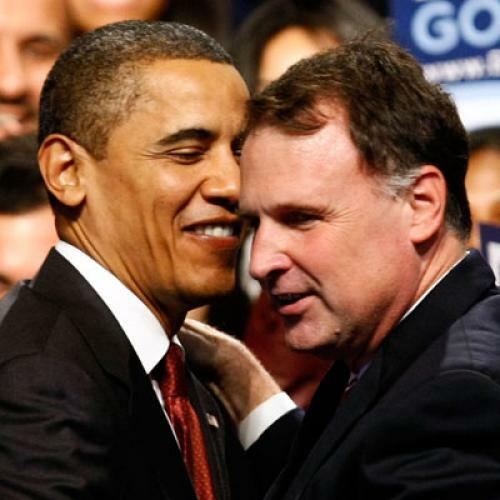 In Virginia, I've argued, Democratic candidate Creigh Deeds, who on his record and on the issues had much to recommend him, suffered at least in part from identification with Obama and the national party. The disapproval of Obama among Virginia voters, which began to climb in late July, may have affected their enthusiasm about Deeds. In the final edition of the exit polls, 51 percent of Virginia's voters disapproved of how Obama has done his job, and 94 percent of them voted for McDonnell. More important, perhaps, is that a lack of enthusiasm about Obama and the national party may have affected turnout. In Virginia, one result of absentee Democrats was the lowest voter turnout for a gubernatorial election in the state's modern two-party history (1969 to 2009). The 2009 turnout of 39.8 percent of the registered voters was the lowest in forty years. Even with all the population growth since 2005, the absolute voter turnout in 2009 (1.97 million) fell below that of four years ago (2.0 million). And the electorate was barely more than half that of 2008 (3.7 million). Astounding. Does anybody doubt African-Americans weren't engaged in this week's elections? Here's some proof for remaining doubters, in a sampling of heavily black precincts around Virginia. Even though Creigh Deeds received a larger percentage of the black vote (93 percent) than the previous Democratic gubernatorial nominee, Tim Kaine, in 2005 (90 percent), the turnout was miserable for Deeds--more than 10 full percentage points lower. He received many fewer African-American votes than Kaine, despite near-unanimous backing from blacks who cast a ballot. Again, you can argue that the drop in turnout was due to the lousy campaign that Deeds and the other Democrats ran, but I don't think that's the whole explanation. There is a general lack of enthusiasm in Virginia and in other states for what the Obama administration is doing, and it contributed to the low Democratic turnout in Virginia. There are two reasons, I think, for the lack of enthusiasm. The first is the continuing economic slump (according to some economists, we can no longer say "recession.") As I have argued before, rising unemployment almost inevitably makes presidents unpopular. And if unemployment rises above ten percent, and stays there for 2010, the Democrats are going to be in trouble in 2010. Their base will not come out, and swing voters will decide to take a chance on the other party. The economists in the White House may have good grounds for believing that unemployment will begin to fall by next June without the equivalent of a second stimulus. But if they don't believe this, or are not sure about it, then the Obama administration better find ways to dole out more money. Increases in spending like this will cause howls of disbelief from the far right and from the would-be centrists, but these kind of measures--and not a further urge to compromise--are what will help the party's prospects in 2010. The second reason has more to do with the administration's political style. While making much of his community organizing background, Obama has failed to keep the Democratic--and more broadly, liberal--base enthusiastic and committed. There is simply no feeling of a political movement or a crusade among the Democratic grassroots the way there was, say, among Republicans and conservatives during a comparable time in Ronald Reagan's first term. If anything, Obama has cultivated an insider style of politics aimed at Congress rather than the public. This is not to say that Obama should hold out for a single-payer health insurance program or nationalize the banks. Like Reagan, Obama should be ready to compromise--and also, obviously, to propose actions that will actually work. But in putting forward their programs, Obama and the White House have to begin to wage more of a public campaign that touches upon the ideals of social justice that got him into office. He has to make clear to voters and to what remains of a political movement that he is not just on their side, but fighting for them. He hasn't quite done so, and that is one reason for the difficulties he and the Democrats encountered in this month's elections.